Winter’s palette tends toward dreary: Outside, the sky is grey, the trees are bare and nothing grows. When the world around you is cold, dark and damp, a little pop of color can enhance your mood, giving you that little lift that helps get you through the day. Chartreuse adds a hint of unexpected color that’s more chic than sunshine or butter yellows. This acid yellow green color works best in small doses, so rather than go full-on chartreuse, try it in an accessory or layer a chartreuse tank under your basic black blazer for a cheery pop of color. On the yellow spectrum, lemon is also in. This shade’s a little less wild, so you can really show some color. Try fun winter wellies in lemon yellow, wear a lemon-colored dress to a nighttime event or include yellow in a separates look. Neon pink turns up the dial on a classic feminine color, giving it the necessary oomph to add flair to your winter wardrobe. Look for flaming flamingo, magenta, fuchsia or hot pink. For a sophisticated work outfit, pair a neon pink or even fuchsia shirt with a black or charcoal pencil skirt for a pop of color that doesn’t lack in sophistication. Or try a neon pink statement necklace, winter scarf or beanie. Orange is still in, so extend the life on some of those orange shirts, sweaters, earrings and scarves you may have picked up for fall trends. Orange can be tricky to pull off in a head-to-toe style and may look too Halloween-y if you match it with black, so try pairing this hue with camel and beige neutrals for a classy take on pumpkin colors. Not every woman’s a warm color fan, especially when it comes to the brighter shades. If you prefer blues and purples, these are still great accent colors to wear in winter. Emerald green is bright yet classy and was just named Pantone’s color of the year for 2013. Rich greens like this evoke the coming days of spring, helping you remember that you can get through winter! This shade works equally well for daytime events and nighttime ones; Angelina Jolie wore an emerald dress to the 2011 Golden Globes, for example. Teal also works well as an accent color for winter. Teal and its cousin turquoise pair well with hot reds and pinks, yet work equally well with sophisticated blacks. Try a teal skirt with a cozy black sweater, or wear teal tights or legwarmers to give your legs some love on a dreary day. If you’re not much for bold colors, start with a hue like teal to build some confidence. After you’ve put a few looks together, work in some of the bolder hues. 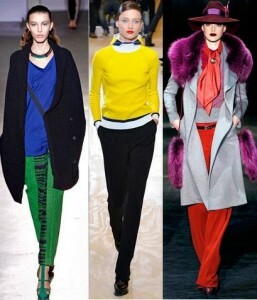 You don’t have to go head-to-toe to give your wardrobe some much-needed color in the depths of winter. Even a splash of color will lift tired spirits.